At the Women's Rights National Historical Park in Seneca Falls, I got a fascinating look at the women's suffrage movement, which was born here in the mid-1800s. The visitor's center features an outstanding orientation film and adjoins Wesleyan Chapel, site of the pivotal 1848 women's rights convention — the first event of its kind in the United States. I then toured the restored home of a convention organizer, Elizabeth Cady Stanton. I learned that Stanton often wrote speeches for her more famous friend, Susan B. Anthony. Neither lived long enough to enjoy the right to vote, but I was impressed with their courage and perseverance. Seneca Falls is on U.S. Highway 20/State Highway 5 in central New York, about 40 miles west of downtown Syracuse. (The town may have served as legendary director Frank Capra's inspiration for Bedford Falls, the town in It's a Wonderful Life. 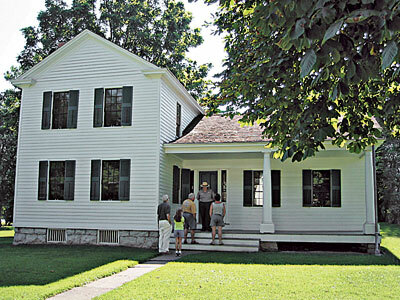 The historical park's visitor center (136 Fall St.; 1-315-568-2991) is open daily, tours of the Stanton home are not wheelchair-accessible.